In addition to their quantitative fit testing services, CSTS are now offering qualitative fit testing to clients either at their training/satellite centres or clients' sites. Qualitative face fit testingQualitative fit testing (shown in the adjacent photograph) can be a particularly effective training tool when used to show the effectiveness of a well fitting and well fitted mask. Face fit testing is a legal requirement. 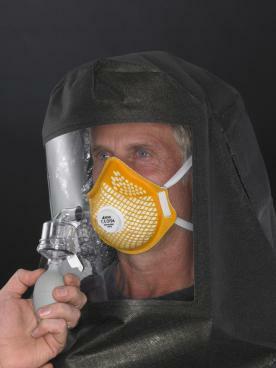 All wearers of close fitting facepieces (including filter masks, respirators, escape set masks and full BA masks) are required to prove that the mask they are using fits their face profile. The face fit test itself is a simple 20 minute test which is either carried out by a machine connected to the mask (quantitative) or by an operator spraying a test agent into a hood worn by the wearer (qualitative). For further information on face fit testing feel free to contact our testers directly on supportteams@csts.co.uk or 01925 244144, or visit our face fit testing services page.